Every Tuesday I make the haul to Jerusalem to teach Studio Photography at Hadassah College. And every Tuesday I pass by the little bakery next to the college and buy myself three little savory cheese pastries to start my day (I’m preggers, im allowed). Over the past few weeks I’ve noticed a new cake in the glass display at the bakery that provoked in me a indistinct memory. The third time I saw the cake it hit me. It reminded me of a cake my mom used to make when I was a child; the memory was so faint though that I was thought that I was making it up. One call to my mom and the issue was solved. She used to make a cake just like the one I had described from the glass display, and she confirmed how much I used to love it. I asked the guy behind the display what the name of the cake is. He said, kadaif and vanilla cream cake. I said, really, that’s it? No fancy name like Napoleon or Black Forest cake. No, he replied-what you see is what you get. In light of the blog and the generations to come (the third on his way), I took it upon myself to attempt to recreate the cake. I decided not to go to the origin and ask my mom for the recipe, but to try to recreate the taste, one memory at a time. First, the kadaif. 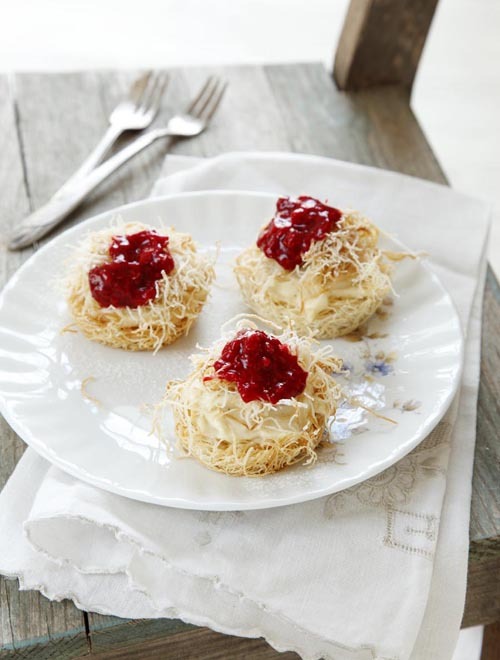 Kadaif are like little vermicelli noodles used often in Arab and Turkish desserts. In Israel they can be found in speciality stores, shuks and sometimes even in the frozen section of the supermarket. Abroad, the best bet would be to go to a local Arab market. I buy mine at the mecca of kadaif noodles, at the “Leon and Sons Bakery” in Yaffo. Leon’s kadaif are known to be the best you can find in Israel, and I’ve fallen in love with the stuff. While working with kadaif, tons of recipes, both savory and sweet were running through my head. Be prepared for some more recipes with kadaif soon. At Leon’s they recommended baking the kadaif noodles with melted butter and a lot of powdered sugar, which helps to caramelize them making them crispier for longer. Second, the vanilla cream. I remembered that my mom used to make the cream using instant vanilla pudding. For the sake of modernity and my love for a proper vanilla pastry cream, I decided to go all out and make the cream from scratch. Kadaif noodles should be stored in an airtight container. They lose their crispiness fast, so assemble the cake just after you bake the noodles. I made a simple berry coulis that went along great with the cake, adding a much needed sour twist. It’s not a must, but it definitely brings it to another level. I made this cake first in a large baking dish, and had some leftover ingredients. So I made them again as individual cakes using a muffin tin. Both were awesome. Preheat oven to 340ºF/170ºC. Generously butter the baking dish. Line a baking sheet with parchment paper. Evenly spread half (7 oz.) of the kadaif noodles into the bottom of the baking dish. Pour over half (2 oz.) of the melted butter and gently massage with your fingers until the noodles are coated in butter. Evenly sprinkle on half (2½ tbs.) of the powdered sugar. Place the remaining half of the kadaif noodles onto the baking sheet. Pour over the remaining butter and gently massage with your fingers until the noodles are coated in butter. Evenly sprinkle on the remaining powdered sugar. Bake both the baking dish and baking sheet for 25 minutes, until golden. Remove from oven and allow to cool to room temperature. Meanwhile, prepare the vanilla cream: Using a mixer fitted with a whisk attachment, whisk together the egg yolks, sugar, and cornstarch for 3-4 minutes, until light and fluffy. Heat the milk and vanilla in a medium saucepan over medium heat until just boiling. Reduce heat and gradually pour the egg mixture into the milk, while constantly whisking. Continue whisking for about 15 minutes, until thickened. Remove from heat and allow to cool to room temperature. Once the cream has cooled, using a mixer fitted with a whisk attachment, whisk the heavy cream until firm. Fold the whipped cream into the vanilla cream until combined. Prepare the raspberry coulis: using a hand blender, mix together the raspberries and powdered sugar until smooth. Assemble the cake: Evenly spread the cream onto the layer of kadaif noodles in the baking dish. Gently crumble the kadaif noodles which baked on the baking sheet onto the cream. 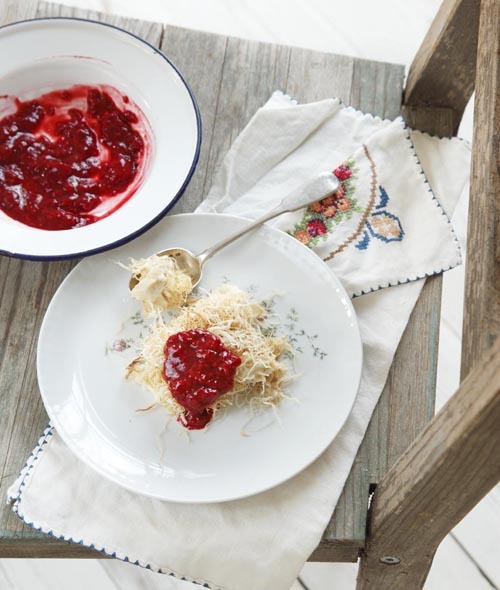 Sprinkle with powdered sugar and serve with raspberry coulis.